A recent report published by Infinium Global Research on ultrasonic aspirator market provides in depth analysis of segments and sub-segments in global as well as regional ultrasonic aspirator market. The study also highlights the impact of drivers, restraints and macro indicators on the global and regional ultrasonic aspirator market over the short term as well as long term. The report is a comprehensive presentation of trends, forecast and dollar values of global ultrasonic aspirator market. According to report the global ultrasonic aspirator market is projected to grow at a CAGR of 5.1 % over the forecast period of 2018-2024. Ultrasonic aspirators are the most versatile and user friendly system for precise control of soft tissues. It allows fine bone dissection in close proximity to delicate structures. Ultrasonic aspirator potentially reduces intraoperative blood loss and perioperative morbidity. It is increasingly being used in carrying out minimally invasive procedures and is widely used in multiple surgical subspecialties, including neurosurgery, gastrointestinal, hepatobiliary surgery, gynecology, and urology. Factors such as increase in demand for minimally invasive neurosurgeries and availability of favorable medical reimbursement policies are driving the ultrasonic aspirator market. In addition, rise in adoption of ultrasonic aspirator in surgical procedures such as acoustic meningiomas, skull or non-skull-based tumor resection, and trans-nasal procedures help to augment market growth. However lack of awareness towards the availability of such treatment options and high cost of ultrasonic aspirator restraint the market growth. Increase awareness and unmet medical needs in emerging economies are expected to provide lucrative growth opportunities for the market. North America is expected to hold the largest market share in 2017, North America is followed by Europe and Asia Pacific. Factors such as increase incidence of neurological disorders and improved medical reimbursement are the factors responsible for driving the growth of North America region. Asia Pacific and Europe region are expected to grow at a significant CAGR. The report on global ultrasonic aspirator market covers segments such as, product, application and end-user. On the basis of product the global ultrasonic aspirator market is categorized into standalone and integrated. On the basis of application the global ultrasonic aspirator market is categorized into neurosurgery, gynecological surgery, brain cancers, ischemic stroke, traumatic brain injury, cerebrospinal fluids related disorders and others. On the basis of end-user the global ultrasonic aspirator market is categorized into hospitals, ambulatory surgical centers (ascs), clinic and others. The report provides profiles of the companies in the global ultrasonic aspirator market such as, Stryker Corporation, Olympus Pvt. Ltd, Integra LifeSciences, Sring GmbH, Biomedicon Systems India Pvt Ltd, Xcellance Medical Technologies, Misonix, Cybersonics, Inc., Meta Dynamic, Inc. and InnoSound Technologies, Inc. The report provides deep insights on demand forecasts, market trends and micro and macro indicators. In addition, this report provides insights on the factors that are driving and restraining the global ultrasonic aspirator market. Moreover, IGR-Growth Matrix analysis given in the report brings an insight on the investment areas that existing or new market players can consider. 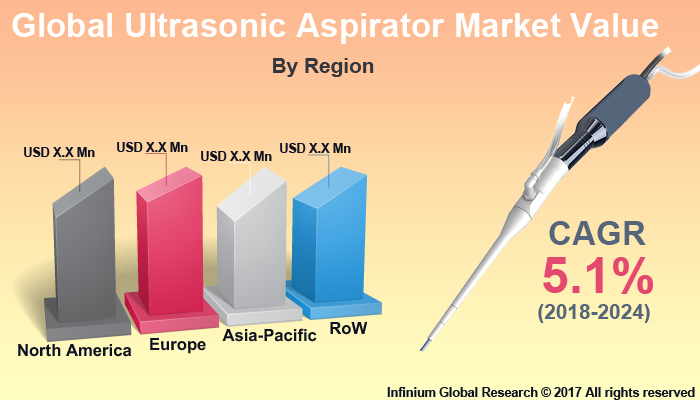 The report provides insights into the market using analytical tools such as Porter's five forces analysis and DRO analysis of ultrasonic aspirator market. Moreover, the study highlights current market trends and provides forecast from 2018-2024. We also have highlighted future trends in the ultrasonic aspirator market that will impact the demand during the forecast period. Moreover, the competitive analysis given in each regional market brings an insight on the market share of the leading players. This report will help manufacturers, suppliers and distributors of the ultrasonic aspirator market to understand the present and future trends in this market and formulate their strategies accordingly.